This sheepskin jacket was a bit of an indulgence last year, though thankfully it's proven to be one hell of an investment piece! It's pretty much been a continuous daily decision: sheepskin or teddybear coat? I still haven't come to a decision - both styles are SO warm and cosy. Yes to layers that keep you warm and still throw some style points your way. Speaking of which, a couple of ways I've been keeping looks cohesive lately, includes opting for neutral chunky knits (even better if they match) and keeping things skinny on bottom. I picked up these khaki skinny jeans while in Germany last week, along with the dark grey version. Never have I loved a holiday-purchase more than I do right now. I refuse to ever believe skinny jeans are in the past, when they balance out heavily layered looks so well. Also not hating how they let you wear heeled ankle boots without crumpling over the tops when you walk. Know what I mean?! Okay, so back to my mention of flashes of metallic accessories. More specifically, I'm talking gold, rose gold and copper. Swoon. 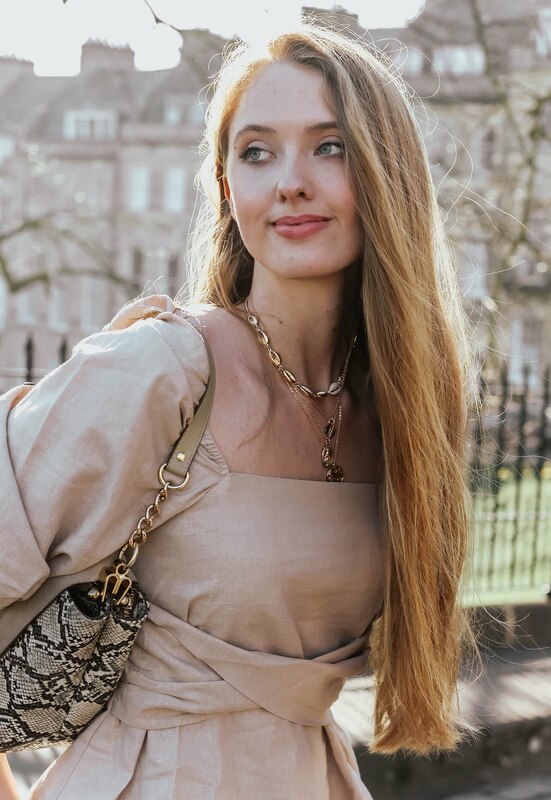 I love how luxurious these tones can look against heavily layered outfits - and they stand out all the more for it. With this in mind, accessories such as this watch and matching bangle go a long way in throwing some sparkle to a heavily neutral outfit. Use the code GLASSOFICE for 15% off at Daniel Wellington! This pebble choker and horn necklace (both by Isonia Jewellery) have also been a go-to duo of mine lately because of this very same reason. 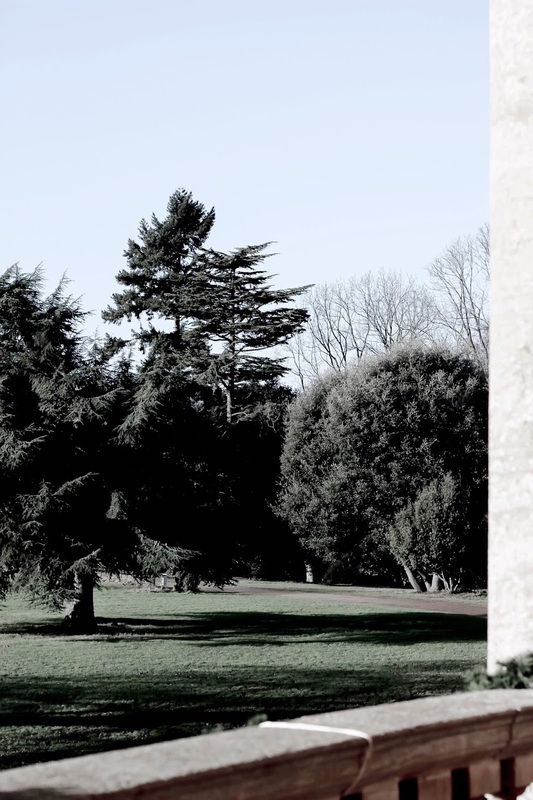 A cosy countryside look instantly transformed - like highlighter for the face. Is countryside glam a thing? It should be a thing. I hope you had a fabulous(ly festive!) weekend. Really looking forward to hearing your thoughts on this look and luxe layering in general. Do you have any favourite go-to pieces when it comes to layering this winter? Let me know in the comments below! All of the chunky knits and layers really do pull this look together perfectly but I have to say I absolutely love your coat!! Love your accessories choices as well@! ohhhmmy your coat looks classy and chic. i hope we have a cold weather like yours,. definitely a chic winter style. This look is gorgeous, and that watch is a beaut! Luxe layering is one of my favorite things, just in life, in general. My own key piece is easily a good neutral sweater. Can't go wrong. I hope you have a lovely new week Gabrielle! I love this layering look, especially because there isn't any scarf in it, because I wear so much polo neck, turtle neck and roll neck that I never wear any! Absolutely love the coat as well!! I am always cold as well, so I bundle up at every opportunity. You look cozy, yet super stylish. That jacket looks extremely cozy!!! And it looks great on you!! Such a great basic piece for the winter! Gorgeous pictures!! Your jumper and coat look so cosy and chic! I get really cold too, and this looks stunning. What a beautiful jacket im in love! I can get super cold too, especially in the early mornings - my hands end up freezing even with leather gloves on! It's great to find amazing pieces of clothing that allow you to stay warm while still looking amazing. I want that jacket! Perfect look dear! Amazing coat! And I love that watch! Girly ou have ABSOLUTELY nailed this outfit, you look so cosy and festive! I'm also all about layers right now and adore that necklace (I put a really similar one on my Christmas list this year!). I do get quite cold easily, especially with these bone-chilling temperatures, bundling up is just smart styling. haha. These are wonderful photos. I just love the cosy coat with the the DW timepiece. <3 Happy Holidays! I totally understand you, Gabrielle! I remember entire winters passed with naked belly or legs, just because it was "fashion" (even if I think winter here is way warmer than at your place)! Luckily nowadays designers seem to have recuperate the reason and finally we have winter clothes for winter season! Your luxe layering is so chic and stylish, and the photos are incredible! You look great and more importantly warm..
hahaha I'm with you on skinny jeans! they are so NOT over! You look angelic Gabrielle! and I could kill to get your photo editing skills! Ohh I love the gloves, the beanie and all the cozy pieces in your outfit. I'm the same, my hands are always cold in the winter even though there is not much of a winter in Vegas LOL! Beautifully styled look! The sheepskin coat is gorgeous and is the perfect piece for elegant layering, such a great find! Thankfully it's not that cold on my side this year. I know the UK is experiencing a cold winter this year and snow too! 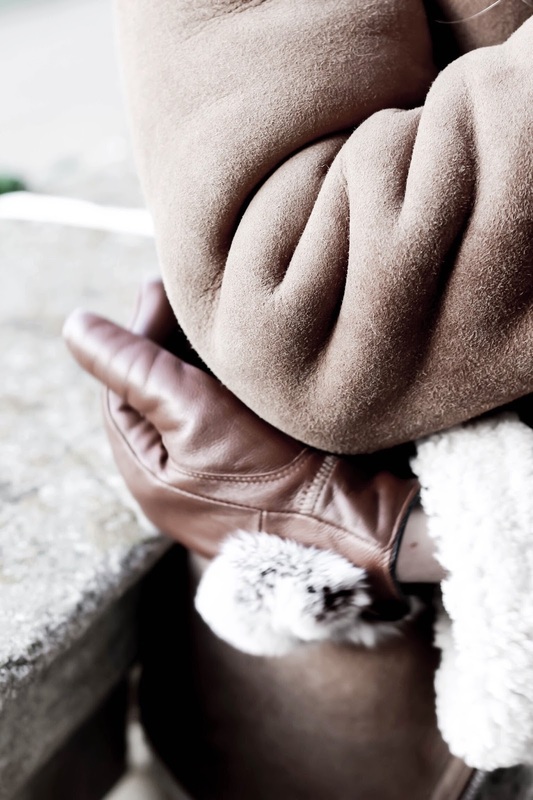 This sheepskin jacket is absolute essential for winter. You definitely know the art of luxe layering of garments and metallic accessories. Fab styling my dear! Have a wonderful Christmas!!! I get cold and hot really easily, it's so frustrating haha. Love the coat so much! You give me CONSTANT clothes envy! One of my favorite things about the colder months is getting to layer. I absolutely love scarves and chunky sweaters. But that coat is to die for and it would go with everything. I want every piece you're wearing! Especially since it'll be highs in the TEENS by the end of this week! I love the details of this look! your dainty jewels are so cute! Your outfit is stunning! I always go for warmth over fashion, ha. I went on Sunday in 2 pairs of tight, socks, a skirt, 2 tshirts, a jumper then a coat, hat and scarf, ha! Such a great selection of layers. I like the pairing. Oh wow love this look and your watch is SO STYLISH ! This jacket is such a winner, babe! I LOVE that layers have become so much more of a statement now! Not only do keep you get to keep so cosy but now you can look chic at the same time too! I seriously need my very own shearling jacket, they're such a lovely piece! Oh yes all about the layering and love the rugged chicness of of this look and that Daniel Wellington watch is SOOOO goreous. the combination is amazing. Love this layering. I am so with you, I feel like this time of year I am ALWAYS cold. Your layering here though is the perfect inspiration. There's just something about chunky knits and textured coats that can really make a look. Also, love your watch! 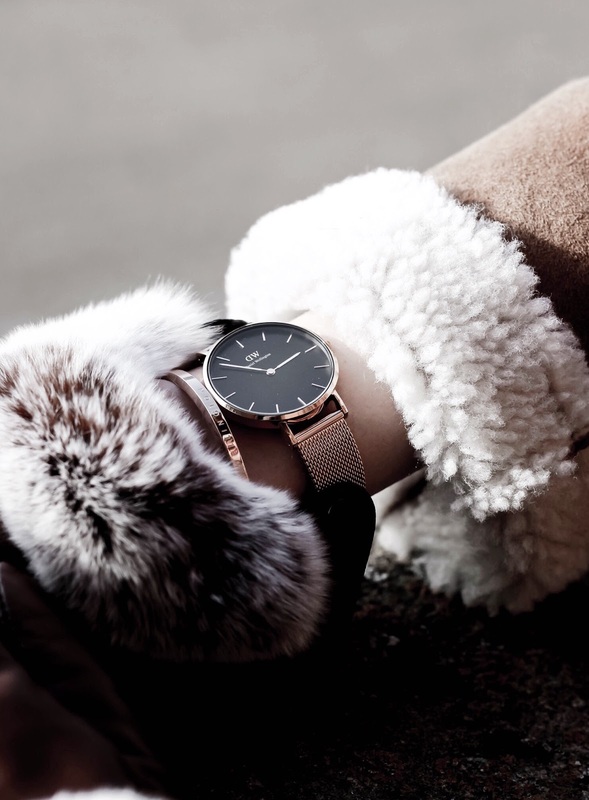 You look perfect for winter.. also love the watch..
Wow, this is really lovely dear. Love your coat, it's simple style, yet looks really sophisticated. You picked the perfect DW for it too! I am crazy about ypour jacket- I am looking for something like this. Such beautiful pictures. Love your outfit! Love the jacket! I'm obsessed with that coat and your photos are so dreamy! So sorry you're cold but it is so great that even the cold can stop to wear you what you like! And this outfit here is no exception - although I think it is really warm :) I love this look! That coat is so gorgeous! I'm a big fan of layering up all the chunky knits and coats on top and keeping things skinny on the bottom too! I wouldn't survive this winter without layering. Surprisingly I get very cold this year. You definitely nailed another winter look. That jacket is stunning. I love nothing more than layering up in the cold weather, being cosy and comfortable is what the winter season is about (albeit the Christmas party)! I’ve got a meeting in London tomorrow and I’m dreading digging out the heels when I just want to be warm and comfy! Such a gorgeous Daniel Wellington watch Gabrielle, I’m always torn between the one you’re wearing and the marble faced one! I love cable knit. Fabulous sweater, hat, jacket and ooh la la those gloves! 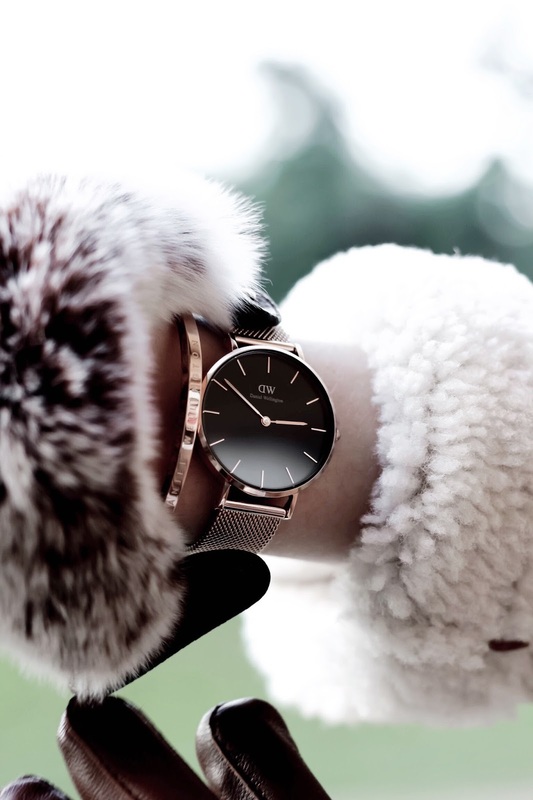 Daniel Wellington makes fabulous watches. I love rose gold.